Johnson & Johnson saw its stock fall 9 percent after the publication of a Reuters report Friday that alleges the company did not tell regulators or the public about asbestos found in its talc products, including Baby Powder, for decades. Individuals have sued Johnson & Johnson for years claiming that asbestos in its products made them seriously ill, but the report details brand-new company documents in which executives, lawyers and scientists discuss powder samples that were found to contain asbestos in the lab. The documents span from 1971 to the 2000s. 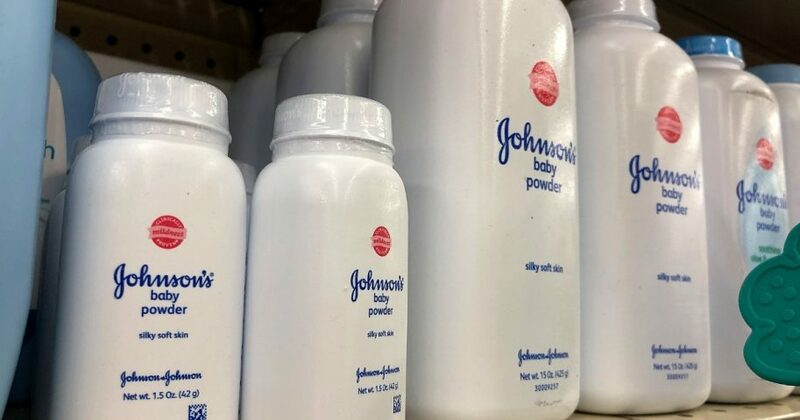 They were made available only once Johnson & Johnson was compelled to share them with 11,700 plaintiffs claiming Baby Powder and similar products gave them cancer, according to Reuters. Asbestos is a naturally occurring mineral that has been linked to ovarian cancer and mesothelioma, a rare form of cancer. The effects of asbestos can take years to manifest after exposure to the carcinogen. The U.S. Environmental Protection Agency banned many uses of asbestos in the 1970s, according to the EPA website. The Reuters story focused on Darlene Coker, a woman who died in 2009 at age 63 after being diagnosed with mesothelioma. She had sued Johnson & Johnson after years of using Baby Powder but was forced to drop the suit in 1999 when she couldn’t provide enough evidence, reported Reuters. Johnson & Johnson has had both favorable and unfavorable verdicts in cases involving plaintiffs who allege its talc products gave them mesothelioma, according to Reuters. In July, a jury awarded 22 plaintiffs nearly $4.7 billion in damages based on their claim that asbestos in Baby Powder and Shower to Shower talc gave them ovarian cancer, reported The St. Louis Post-Dispatch. Shower to Shower is a brand that Johnson & Johnson used to own, according to Reuters. Johnson & Johnson says it will appeal the verdicts against it, reported Reuters. The earliest mention of asbestos in Johnson & Johnson’s newly shared documents came in 1957 and 1958 lab reports on talc sourced from Italy. The reports didn’t refer to asbestos by name but mentioned a contaminant known as tremolite, which is a form of asbestos. In 1969, a Johnson & Johnson talc executive asked a company doctor in a memo about tremolite, which he said it was “normal” to find in U.S. talc deposits. The doctor responded by informing Ashton of the potential medical dangers of the substance and telling him “it would seem to be prudent to limit any possible content of Tremolite … to an absolute minimum,” according to Reuters. Talc products are just a drop in the bucket that is Johnson & Johnson’s revenue. Those products made up $420 million of the company’s $76.5 billion in revenue in 2017, according to Reuters. Johnson & Johnson has been sued for allegedly colluding with a former U.S. Food and Drug Administration commissioner to enrich themselves by failing to disclose the dangers what the lawsuit deemed a “deadly” antibiotic. The allegations against Johnson & Johnson come as other groups in the health industry face scrutiny. For example, at least 16 drug companies making roughly 300 generic medications are facing increasing pressure in an illegal price-fixing investigation. And e-cigarette giant Juul is facing criticism for allegedly marketing its adults-only product to teens, although the medical community does not understand what vaping does to developing minds and bodies. The Daily Caller News Foundation reached out to Johnson & Johnson but did not receive a response at the time of publication.